I’m linking up with Lauren of The Little Things We Do for some more “Fill in the Blank Friday” fun. 1. Nothing says fall like pumpkins . 2. My favorite autumnal tradition is midnight shopping on “Black Friday”. Yeah, I’m one of those “crazy” people at the malls. Even if I don’t intend to buy something, I’ll go out for the fun of it! It gets me super pumped for Christmas. The Boy wouldn’t even walk beside me in some stores last year because I would start singing Christmas music. 3. My favorite fall treat is pumpkin cheesecake . 4. Fall makes me think of my childhood home because I would actually ask to rake the yard. Weird. 5. Autumn free form word association, go! fashion, pumpkins, apples and Halloween . 6. My go-to outfit in the fall is a dress, cardigan,and cute shoes. I really want a pair of riding boots this year. 7. My favorite fall holiday is (Halloween or Thanksgiving) umm…I love food, but I really like dressing up…so Halloween? Yeah, Halloween. I usually drag Mike out on the Friday and Saturday of Halloween weekend to go “Monster Mashing” around town. I was an 80’s girl last year, but we don’t have pics of the awesome tutu I made. *In case you’ve not seen a picture of my hubby…that is NOT him. LOL. He’s the one wearing a mask in the first picture. What is the most memorable Halloween costume you’ve ever seen or worn? 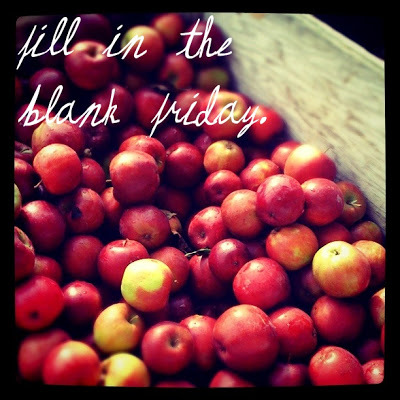 I love these fill-in-the-blank Friday posts, but I still haven't done one yet. I need to remember one of these weeks!